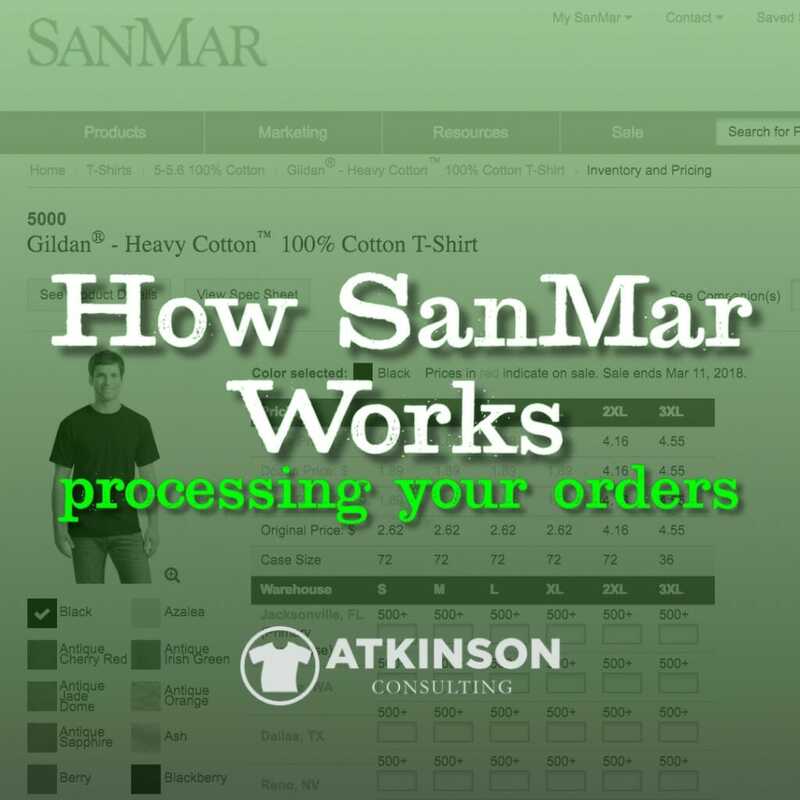 Have you ever wondered how your order gets picked once you hit the submit button at SanMar? One of the things I was able to line up at this past January’s ISS Long Beach show was a behind the scenes look at the SanMar facility just west of Phoenix in Avondale, Arizona. It’s just around the corner from where I live. Actually, it’s about 45 minutes away, but that’s close enough. Hold on to your seats, because frankly, it was amazing. Todd Burns, the general manager of the facility graciously walked me around the building with a wonderful tour. At about a million square feet, that took some time. What’s interesting is that this isn’t even the largest one SanMar owns. That’s their Cincinnati location. It handles about a third of their sales volume. There are eight of these warehouses around the country. The Avondale Arizona location is SanMar’s second smallest facility. That puts things in perspective. Todd is a really nice guy. He’s a Pittsburgh Steelers fan and sure loves BBQ too. Running warehouse facilities has been his career and has taken him all over the United States. He’s been with SanMar for about seven years now. Previously he worked for QVC. The one thing that’s obvious about Todd is that he has a really solid connection with the people that work at that facility. As someone who has led large groups of people, I know that the personal attention he gives his staff means he is involved. It’s a good thing. Todd doesn’t manage from his office, he goes where the work happens. In Lean terms, that’s Go to Gemba. Todd very patiently explained the interworkings of this complex warehouse center. SanMar stocks about 70,000 SKU’s in the building, and they divide it up so the restocking, picking, shipping and everything in between happen seamlessly. SanMar has a fantastic computer system that controls everything. We’ll get to that in a bit. So now, let’s start the tour! It seemed like a natural place to begin the tour, so we walked the width of the facility to that area. You knew it was going to be a monstrous building from the outside, but walking around in it is even more impressive. For one, it was surgical room clean. Everything is very neat and orderly. Polished floors and not an ounce of debris or scraps of paper on the floor to be seen. Motion-sensor controlled LED lighting popped on as we walked. The receiving area was wide and expansive with an efficient layout of gravity roller conveyors that feed the boxes to other parts of the floor. All around the area were skids in varying degrees of completeness. The crew was about halfway finished unloading a truck with a mixed assortment of apparel. Todd explained that when the cases come in they are scanned with an RF Scanner, and that starts the process of putting the inventory away into the correct bin in the building. Remember that scene in the original Raiders of the Lost Ark movie at the end when they file away the wooden crate that contains the Ark in a massive warehouse? That’s what it felt like walking through the aisles at SanMar after we left Receiving. For one, the aisles had shelves stacked somewhere between five or fourteen layers high. These are skids of inventory as far as you can see. That might not seem that high in a blog article, but remember at the highest point the ceiling in the building is forty feet high. I made a joke to Todd about not wanting to man the forklift to pick something from the top shelf and he agreed with me. Whew. There is a method to their madness at SanMar. All of the inventory in the building is divided up with one thing in mind. 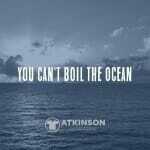 Goods that are constantly being bought by you the customer, are easier to get to than an item that isn’t as hot. They divide these up into three bays. The Fast Bay is for the, you guessed it, fast-moving items. Here’s where the hottest SKU’s are kept, so they are just a lightening-fast pick for Todd’s team. This contains the top 1% of the SKU’s. These are in full cases, and not in any individual bins. They turn the inventory in this area so quickly, that putting anything in a bin is a waste of time. The Low Bay is for the regular stuff. It gets ordered but isn’t the tidal wave of commerce like the items in the Fast Bay. Lastly, the Slow Bay is for the stuff they keep on hand, but might not be ordered all the time. Individual shirts are here. These are where the XS or the XXXXL shirts are stored for picking. Todd also referred to this area as the High Bay. My label seen above was stored in this area once. Can you imagine how insanely complex picking all of the orders that come in every day must be? 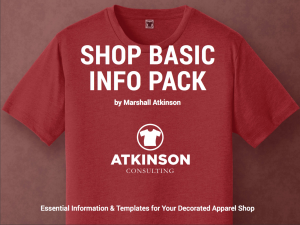 Think about how you buy inventory for your shop. Sure, sometimes you are ordering full cases. Sometimes not. Occasionally you need a sample or two only. Now, multiply that by how many shops are in your area. Your state. Maybe even your area of the country. It exponentially grows more complex every business day. It is an avalanche of goods to be picked, and every SanMar order is different. But each has to be accurate and shipped on time. I got a headache just thinking about it. Especially when you see all of that inventory. Let’s pretend you just placed an order. You do that all the time, right? After you click submit on the SanMar website, there is a quick credit approval as they validate the business end of things. Then, the system verifies the stock in the warehouse. Then the order is on hold for five minutes. Five. That’s how long they wait to see if you need to make a change. Because, you know, we’re human. We order the wrong color. Or size. Maybe you were all thumbs on the quantities. After the five minute purgatory, the system releases the order. Then Todd’s crew rockets into action. The Avondale facility opens up every day at 7:30 am. But 90% of the work crew doesn’t clock in until noon. As you can probably guess, the lion’s share of the orders come in the late afternoon. Most shops send the orders right around the 5:00 pm cut off time for UPS ground shipping. PSST is 1:00 pm. To rock and roll on the orders, the staff has some help. For starters, they have a great warehouse inventory management system that knows where each shirt in the building is located. Workers wear headsets that instruct them where to go next. For the sake of discussion, let’s say you ordered 750 Gildan G-5000 Black XL shirts. Since these are sold in cases of 72, that means there will be ten cases of 72 plus an extra box of 30. One worker would be routed to grab the ten full cases. Another person is routed to pull the 30 loose shirts and box them up. If your shop is part of their PSST program (Pack Separately Ship Together), there is a special spot in the SanMar shipping department for your shop. Your inventory is brought here, and then combined with any other orders and shipped to you. But if your shop isn’t part of the PSST program, then it leaves via UPS. The 10 case pick and the 30 shirt pick are not combined at SanMar. For speed, they meet in the UPS truck for the first time. Walking through the aisles I noticed that nothing was placed together. In the shops I’ve run, similar inventory was stored together. All of the Black Gildan G-5000 are just on one skid or shelf. Not at SanMar. It’s sort of together, sort of not. To ensure accuracy, the bins for the same inventory colors are not kept together like you think. They might be in the same aisle or shelf, but they are not housed side by side. Because if you placed that Gildan G-5000 XL Black, next to the L Black someone might either grab the wrong one or put the wrong one in the bin by mistake. But when it is in the same aisle, but five feet away, nobody is making that mistake. Not together helps with accuracy, near each other is for speed. All throughout the facility are roller tracks that move cases around the building. Everything feeds to one spot. As the boxes wind their way down to this area on the rollers they pass a scanner. The scanner reads the LPN label and knows what’s inside. The Fast Bay items are located behind shipping, so if anything needs to be added the box is siphoned off with the roller system and the needed product can be added. SanMar knows who picked the items for the order. Based on their accuracy and length of service in the position, the system determines if the order is flagged for a Quality Control Audit. This is specific and not random. If chosen the order is sent over to a QC area, where a computer screen lists the items that should be in the box, but not the quantities. It is a pass or fail manual recount. Green means go ahead and ship it. Red means there is a problem. If there is a challenge the team member that picked the order is brought over for an instant review of the situation. What is interesting is that one of the most common problems that show up is that the mill counts will be off. Usually by one. Instead of twelve in a folded dozen, there are eleven. Or thirteen. I like that the crew gets real-time feedback. They aren’t waiting until the end of the week or a performance review. It happens immediately. One of the great ideas that Todd explained to me is that SanMar is continually auditing their inventory. About 10% of the SKU’s are verified every day. This happens while the team is working. While they are in front of an item area they can perform a validation of the inventory in the bin. This is reported back to the SanMar master brain. It’s why when you go online they can tell you to the piece what’s on the floor. They don’t stop to do inventory counts, as they do them constantly. Ok, sorry for the tangent. We wound up our tour in the shipping area where seven employees were busy getting orders ready. Most of the tasks are automated, but the team still needs to process some work. In the shipping area, there are twelve loading docks. Usually, the same UPS route backs up to a certain one. This is a newer facility, and it is taking pressure off of the other SanMar warehouses in Reno, Nevada and Irving, Texas. The Avondale location ships all over the southwest, and to a lot of shops in California. The busiest times for work in the building happen between 3:00 pm to 5:00 pm every day as that’s when the lion’s share of orders are coming in. It’s a mad rush to get everything out and shipped. The SanMar system prioritizes the pick’s based on the time and ship to location, so the goods can go on the correct truck that’s leaving. Monday is their busiest day of the week, and Friday is the slowest. I have to give Mark Bailey and the SanMar Decorator Relations Team a gigantic high-five for organizing my field trip. I’ve wanted to get the behind the scenes tour of a distribution center for quite a long time. Mark instantly made it happen when I asked. Also, a big shout out to Todd Burns. He answered all of my questions and was very patient with me as I tried to grasp the complex process at SanMar that is second nature to him. You can tell that Mark and his crew live up to the 4 “A” standard that SanMar covets in their culture. Attitude. Action. Attendance. Accuracy. It’s easy to see why Sanmar has such a fantastic reputation in the industry.